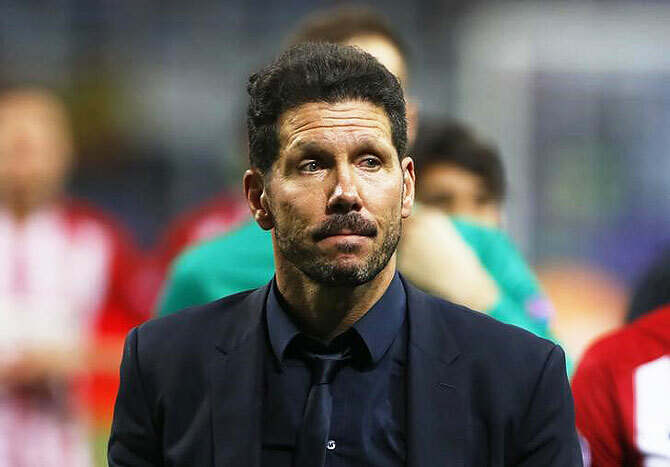 Diego Simeone may not have the stomach to reinvent Atletico Madrid again after they suffered another morale-shattering loss to Real Madrid in Saturday's Champions League final. The Atletico coach left doubts in the air with vague answers about his future following their second Champions League final defeat in three seasons to the same opponents. It would be perfectly understandable if the combative Argentine, habitually dressed in all-black, decides he has taken Atletico as far as he can. Having joined a club teetering close to the relegation zone in 2011, he lifted them out of danger and won the Europa League title, the Copa del Rey and La Liga within three years. Each triumph saw key players depart, invariably to richer clubs, yet Simeone always contrived to rebuild his side. “To be with Atletico is to be perseverant, competitive, never give up, fight against the difficulties and to know that there are opponents who are better than us,” he said at one stage. The question is whether he will want to go through the whole process again. Whatever he decides, it is almost certain that Simeone will be back somewhere, more likely than not at a club looking to upstage more glamorous rivals. Over the course of his career, Simeone has made a habit of picking himself up, dusting himself down and starting all over again. Simeone suffered a huge setback relatively early in his career when he was in the Argentina team which infamously lost 5-0 at home to Colombia in a World Cup qualifier. Nevertheless, he went on to win 106 caps for his country and played in three World Cups, although those themselves all ended in disappointment. There was, though, also plenty of success amid the frustration including two Copa America titles with Argentina. Revered wherever he has gone for his undying commitment to the cause, he helped Atletico Madrid to win a league and cup double in 1996 and repeated the trick with Lazio four years later. His coaching career has been a story of similar ups and downs. It began in spectacular style as he led Estudiantes to their first Argentine championship in 23 years after they dramatically overhauled Boca Juniors, then won the same title with River Plate two years later. At one point, he was seen as favourite to replace Alfio Basile as Argentina coach but was swept aside when it became clear that Diego Maradona wanted the job. His career then took a dive as he quit River amid a dire campaign which left him so angry that he broke his hand in one game after smashing it against the substitutes' bench in a fit of rage. His philosophy has always stayed the same, however, and there was no change on Saturday. "We just have to keep on working, and persisting,” he said.